My interval walk/run was the best way to wake up and start my day – I honestly feel super entergized now. I started out with the usual morning burst (hot water plus lemon slices) before I moved on to breakfast. 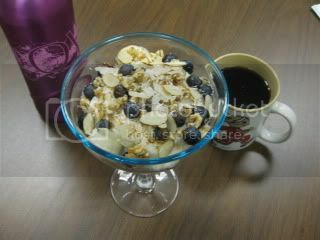 Today’s breakfast was another awesome parfait. I LOVE how thick and creamy you can get your greek yogurt when you make it yourself. I decided to have some decaf Starbuck’s today with breakfast as well. 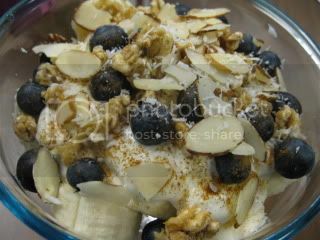 When I sat down to eat my fantastic parfait, I realized the best ingredient ever was missing ~ Sweet Cactus Agave Nectar! I used a 15 calorie 1 tsp drizzle. It was a great way (4 Weight Watcher Point) way to start my day. I think I learned that how you eat the night before really impacts how hungry you are the next day. I think only having veggie soup for dinner on Sunday night led to me being ravenous all day long…..Have you all ever noticed this happening to you? Today is going to be super busy, but, I plan on taking a Body Sculpting break at lunch. I do not have time for any fun stuff today 🙁 Sorry All – I am off and running! I will catch up with all your comments and all later this afternoon or tonight! « We bought a new fridge, oh & more recipes! Hmm…I'm rarely awake at 5 am, haha! I think what you eat the night before definitely affects your hunger levels the next day. I find myself more hungry if I work out and don't eat a snack before going to bed. You and your parfait creativity! I can't wait to learn how to make greek yogurt. My soy yogurt is so watery. Your parfait looks great!! I'm excited for you to go to Vegas – it sounds like such a fun city! For me, I know that if I don't eat something before bed I wake up ready to chew my arm off! ahahahaha i love the blue balls! you crack me up! the parfait looks amazing. i have made my own greek yogurt before via straining, the only part that bugs me is i don't know the protein grams that it ends up with. i am a number freak, what can i say? you burn so many calories in a day! so impressive. your deficit must be through the roof! when are you going to vegas?! i can't wait to see your greek yogurt recipe… i'm curious to see if i would like the taste of homemade a little better than store bought. it has a whang that i just haven't been able to fully embrace. i definitely feel hungry on days when i don't eat much the night before…i like to wake up hungry, but not ravenous! it's a very delicate balance for me. oh, and before i forget…i think i won't be doing the bootcamp with you gals…i didn't realize you had an official workout and everything that you'd be sticking to! i'm currently doing a post-natal bootcamp workout along with bfl style eating to try and lose the last bit of my pregnancy weight. i just thought it'd be good motivation to take part in some sort of challenge…sorry for the flake-out on my part!! I am totally impressed with your ability to be up early and exercise. Every day I try that I end up losing the debate against myself and end up resetting the alarm in the morning to sleep in. Bahaha I totally laughed at the "blue balls" bit, I admit it! That parfait looks spectacular! I'm ready for breakfast now, haha! Parfait's are all over the blogosphere. Yours looks amazing. I agree what I eat for dinner definitely has a major influence on my hunger the next day! Thanks everyone for all your feedback on what you eat the night before – it was awesome to hear your thoughts. I definitely think there is some truth to it. Dr. Davon ~ Thanks so much for the compliments. I will definitely have to check out your site – thanks for the link. 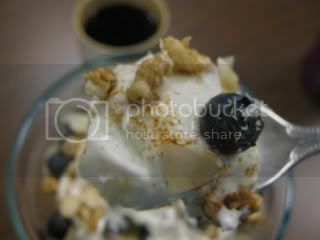 Janetha ~ I saw the blue balls on Marisa's blog and now that is forever what blueberries are to me 😀 I think it's the double to triple workouts that are helping my calorie burn for sure. I am not complaining either way! I just need to focus on the eating side to keep that deficit. Thanks for the feedback on what to eat before I go to bed – great point. We got to Vegas on the 25h for 5 days – yahoo! I am not sure I officially announced it yet lol. 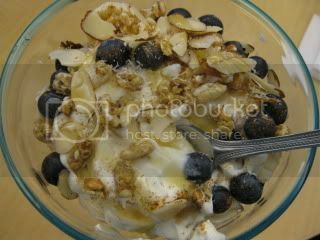 Sarey ~ I have found greek yogurt to be something I like versus plain regular. Greek yogurt is not bitter and running like regular yogurt. It is thick and creamy but my favorite way to have it is with a little agave nectar drizzled – sooo good! No worries on the bootcamp – you can still play along for fun. I LOVE challenges too so if you can think of something, let me know and I'll be glad to try it out. You should check out Janetha's site (she is above) – she is a big bfl person and her site is all about that. C.G ~ That's just it – I have to get up without thinking and go through the motions. Once I get going I am good, the hardest part is to get going. I LOVE having it checked off my list so when I get home there is not obligation and nothing to get in my way. Priyanka ~ I LOVE parfaits – you should definitely try them! Janetah ~ That is SO COOL that you all have a bfl forum! I belong to a couple of "groups" too so I totally get it. It's all very motivational.